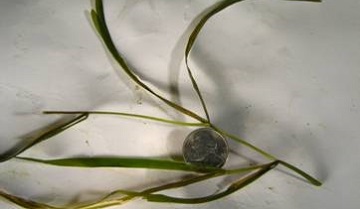 Flatstem pondweed has both a flat stem and flat leaves. Another name for Flatstem Pondweed is Narrow Leaf Pondweed. Flatstem Pondweed grows completely submerged in the water. Its flat and angled leaves are the first visible and distinct feature. The leaves themselves have one large vein that runs down the middle, with many other smaller veins running in parallel down the length of the leaf. These veins make the leaf more stiff and rigid than other aquatic plant leaves. The only part of the plant that breaks through the surface of the water is the fruit, which looks like a cylindrical spike. Dirbrox® herbicide, Aquathol Super K, Hydrothol Granular, and Aquathol K liquid can be used to treat flatstem pondweed. You can order these products on this website.